Normally today’s computers shouldn’t present any problems to rapidly calculate trigonometric or transcendental functions by any means. Developing better algorithms appears to be more sporty than really practical. However the growing number of embedded applications based on micro-controllers may ask for gain in speed and memory economy, since those applications are fundamentally characterized by limited resources and optimized designs in order to reduce costs. Thus, fast and memory economic algorithms keep playing an important role in this domain. The present algorithm was developed during the elaboration of Ultimate ROBOLAB, an extension to the ROBOLAB software[iii] , known as a powerful graphical programming environment for the LEGO RCX. By difference to standard ROBOLAB that works with interpreted code, Ultimate ROBOLAB[iv] directly generates Assembly code from the graphical code, compiles it to Hitachi H8 byte codes which are then downloaded to the RCX. The algorithm has three important sections: the first one -universally known- consists in reducing the function f(x)=exp(x) to f0(x)=2x - respectively g(x)=ln(x) to g0(x)=log2(x) - the second section concerns the arrangement of the numbers in the particular way to have the CPU only compute f0(x) or g0(x) for x Î [1,2[ and the third manages a fast computing of f0(x) and g0(x) to any desired precision according to a look-up table composed of 22 numbers only for IEEE 754 standard single precision floating point numbers. During the execution of the elementary functions, in any case the CPU has to operate less than 22 products. The average case turns around 11 multiplications. The development of Ultimate ROBOLAB, a LabVIEW-based graphical compiler for Hitachi H8/300 code, is a particularly interesting demonstration of the typical constraints to which embedded design with micro-controllers may be submitted. Ultimate ROBOLAB is destined as a development tool for advanced users of the well-known LEGO RCX. This module had been invented as the central part of the LEGO Robotics Invention System (RIS), a highly sophisticated toy that, due to its excellent features, has found many applications as an educational tool in schools, high schools and even universities. The heart of the RCX is a 16MHz clocked Hitachi H8/3292 micro-controller. Besides peripheral devices and 16kB on-chip ROM and 512 bytes RAM, this micro-controller encapsulates an H8/300 CPU that has eight 16-bit registers r0..r7 or sixteen 8-bit registers r0H, r0L, … r7H, r7L (r7 is used as the stack-pointer); 16-bit program counter; 8-bit condition code register; register-register arithmetic and logic operations, of which 8 or 16-bit add/subtract (125ns at 16MHz), 8.8-bit multiplying (875ns), 16¸8-bit division (875ns); concise instruction set (lengths 2 or 4 bytes); 9 different addressing modes. Together with 32k external RAM, LCD-display, buttons, infrared communication module, analog sensor ports and H-bridge output ports, the RCX is an ideal instrument for the exploration of micro-controllers in educational contexts. In order to attribute most flexibility to the RCX for all kind of robot projects, the programming environment Ultimate ROBOLAB required a firmware kernel that should guarantee memory economy and execution speed. Thus each part of the kernel had to be optimized to the limits, so that users could dispose of a maximum of memory for their own code and sufficient reaction speed for reliable robot behaviors and closed loop controls. This was particularly challenging concerning the inclusion of an advanced mathematical kernel that comprised IEEE 754 standard single precision floating-point operations, among which the square root, trigonometric and exponential functions. Scrutinizing the subject with the target to find algorithms that could best balance the requirements rapidly ended in the choice of Heron’s algorithm for the square root and CORDIC[v] for the trigonometric functions. However the exponential functions revealed themselves as more difficult. While being easily programmable, these series present the disadvantage of converging only very slowly, leading either to unacceptably long computing time or unsatisfying inaccuracy. Other high-speed alternatives known from FPGA or DSP implementations, and based on large constant tables had to be excluded as well. A remarkable representative of efficient table based algorithms was presented by DEFOUR et al[vii], who succeeded in obtaining high precision function approximation with a multipartite method by performing 2 multiplications and adding 6 terms. The trade-off, and the reason for the disqualification in our application, is that the table size grows exponentially with the precision. For example, in order to get 23 correct bits, corresponding to an error of ½ ulp (units in the last place) in the case of IEEE 754 standard single precision floating-point data, the exp(x) function needs a table size of 82432 constants. Obviously such a table would explode the RCX memory capacity. These nodes serve as reference-points for a 9th order polynomial curve fitting. While applying the Horner Scheme[x] to the polynomial, the number of operations is a total of 9 multiplications and 9 additions per function call, compared to 7.2 + 1=15 multiplications and 9 additions for the straightforward polynomial calculation. 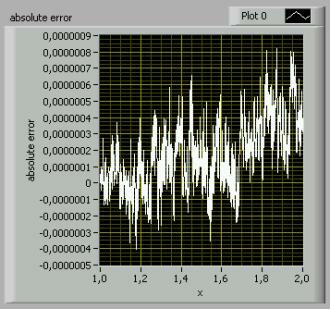 The accuracy that can be obtained with the algorithm is about 3E-7, as can be seen in the result of a LabVIEW simulation (picture 2). 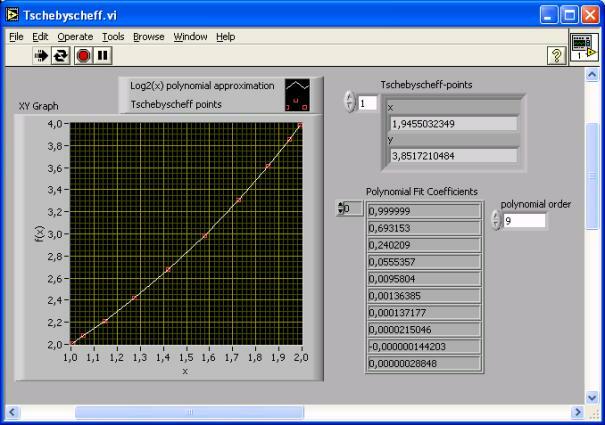 Picture 1: Operating the polynomial fit with LabVIEW 7.1 on the base of 10 Chebycheff nodes. A similarly efficient polynomial approximation could be set up for the log2(x) function in the special case of xÎ[1,2[ . Of course satisfying algorithms must be added to extend the functions to the ranges ]-¥,+¥[ respectively ]0,+¥[ . The further investigation of the subject however led us to the algorithm that is described in this paper as a better solution for the purpose, combining memory economy and execution speed in the case of IEEE 754 standard single point precision floating-point representation[xi]. This equation signifies that any x must be multiplied with the constant c=1/ln(2) before computing the f0 function. Convention: we may suppose x>0, because of the trivial e0 =1 and e-x = 1/ex allowing an easy computation for any x. The IEEE standard floating point representation transports three information-parts about the concerned number: the sign, the biased exponent and the fractional part (=mantissa). Normalized mantissas always describe numbers belonging to the interval [1,2[ . Note: it is not possible to represent the number 0 in this form! Thus the result 2(x-1) will always be normalized to the IEEE standard. In practice, in order to maintain the result normalized during the whole computation, it is advantageous of operating the multiplication by 2 only at the end of the calculations simply by increasing the exponent. Compared to the Chebycheff polynomial approximation, there is a non-negligible loss of accuracy. Another trade-off is the fact that the number of multiplications depends on the number of significant bits, whereas the polynomial algorithm keeps the number of operations constant. This certainly is an issue, if higher precision representations are chosen. The computational worst case would be to operate a product with m = b’1111111 11111111 11111111’. This would require 22 multiplications (remember that the last bit may be ignored). Since the numbers 0 and 1 have the same probability to appear in m, the average case only requires 11 products. If we assume the empirical assertion that a floating-point multiplication needs about 5 times longer than an addition, the algorithm would be operated within the time of 11*5=55 additions, while the polynomial approximation would need 9*5+9=50 additions. Thus the average computing speed may be considered as sensibly equal for both algorithms. However, a considerable speed gain can be obtained, if the algorithm is programmed at lowest level, where the access to the floating-point representation itself is possible. (This is practically required anyway, since the look-up-table items are selected on the mantissa bits!) One disadvantage of the polynomial algorithm is the fact that the multiplications produce un-normalized results that need to be re-expanded and also aligned for the additions. 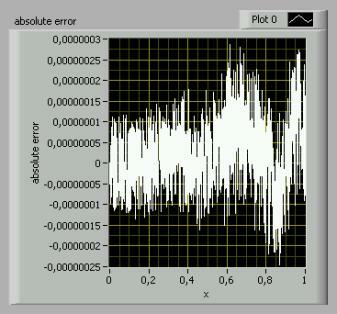 With the square-root algorithm, such normalizing procedures are superfluous, since it is guaranteed that after each multiplication the result is normalized. Thus, calling a primitive floating-point multiplying function without the normalizing procedure can substantially accelerate the execution. Another possibility to reduce the computing time may be given, if less significant mantissa-bits are being considered. Indeed, it might be useful in some cases to gain speed instead of accuracy. In this case, the gain, compared to the Chebycheff polynomial approach may be remarkable. ]-¥,+¥[ -or the portion of this interval that corresponds to the single precision representation. At first sight, the operation looks like being very easy and fast, since only the f0 function must be executed and the result of that operation be multiplied by the rth power of two. The latter operation could be done simply and rapidly by increasing or decreasing the binary exponent by |r|. However there is a hook ! The issue is that the floor-function, representing the truncating of the floating point value, needs quite an impressive amount of execution steps, because it cannot be deduced by simple means from the IEEE 754 floating point representation. Therefore we propose a rather unorthodox approach that will end in a very reduced program code size. This equation doesn’t mean anything else but to compute successive squares of the 21.m value, each one representing a single multiplying. Note that the relative error grows in a benign way with each multiplication, even if the 2nd condition of the cited theorem in 2.3.1. is no longer fulfilled. To compute the product for any q, we can operate a simple offset-shift in the look-up table only depending on the value of q. Note that "q<-22, 2x will be considered a 1. Preliminary notes: For this sample the DELPHI language -former TURBO PASCAL- was chosen because of the better overview concerning stacked ifs and for loops, than known from C++, even if no such compiler seems to exist for micro-controllers. The bulk of this section is to most clearly present an astute and short implementation of the algorithm that can be easily traduced to any current language. For simplicity, the “NaN”, “infinity” and “denormalized” handlers have been omitted. However they should be added to a real implementation in order to keep everything standardized according to IEEE 754. Obviously the code is set up with respect to the single precision data representation. begin //values 0 and MAX_ITERATIONS included in the for loop! Note: From the IEEE standard point of view, y must be considered as partly “denormalized”, since the leading 1 must be missing before the binary point. Since the successive values of x and the LUT numbers that are used with the comparisons are always normalized, the comparisons can be fast computed. But this time the multiplications are operated with un-normalized numbers (2nd LUT). However, it is obvious that the multiplications always remain in the interval ]0,1[. A low level fast multiplying routine can be set up for these numbers, increasing the computing speed. Nonetheless the log2 algorithm implementation seems trivial and a sample code can be omitted in this document. This algorithm package may be helpful to implement fast calculations for the exp(x) and the ln(x) functions in the special case of IEEE 754 standard single precision representation to any desired precision in the given range. [i] “Convict” doesn’t have the same meaning in French-spoken countries than in Anglo-Saxons. The term is derived from the Latin “convivere” = living together.